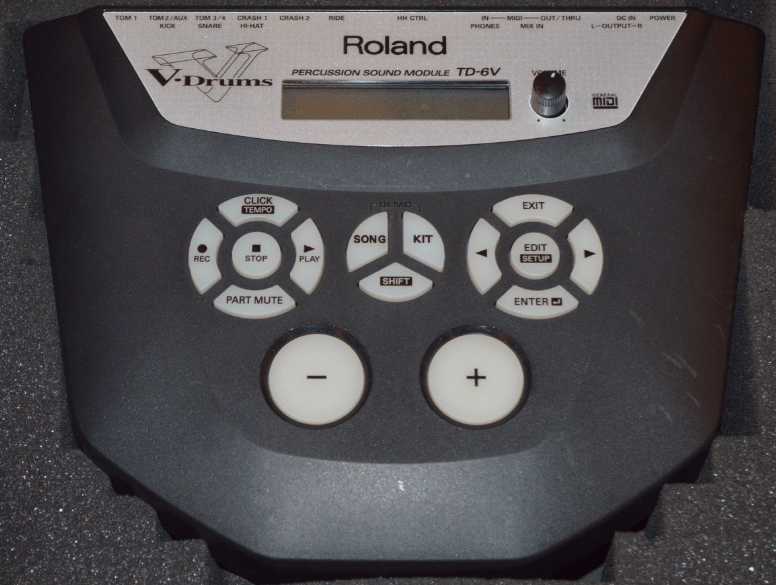 The Roland TD-6V Percussion Instrument is a major part of the Roland “V-Drums” line up. This week I had one for repair. Lets take a look under the hood and see whats makes this machine tick, or in this case not. This one came to me with the complaint that it would just cut out during performances. The display remained on, and it still responded to controls, but wouldn’t produce sound. After a bit of fettling it would come back to life. This might happen 2 or three times during a set, or it might not happen at all, and behave itself right through. Initially I suspected that it would be a worn or loose output jack. It’s not uncommon – it happens all the time. In a well used mobile unit the cables are plugged and unplugged all the time, and the spring tension in the ¾ inch jacks goes, resulting in poor connections, and intermittent disruption to the signals. However the problem in this case turned out to be something else. Lets strip the machine down and see where we get to. 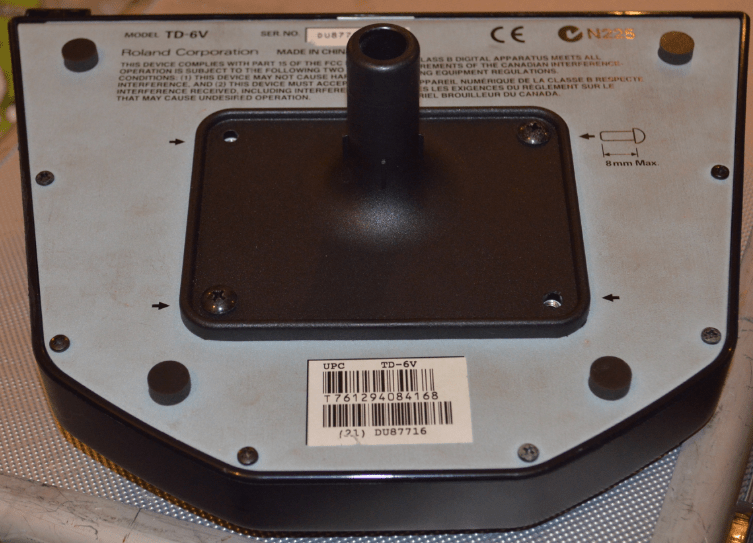 We start by removing the bottom plate, including the stand adapter. There are a number of small black self tapping screws to remove from the underside, and you need to remove four or five from the rear side, where all the jacks are, including the cable strain relief screw. Once these are out the metal bottom plate just lifts straight off. 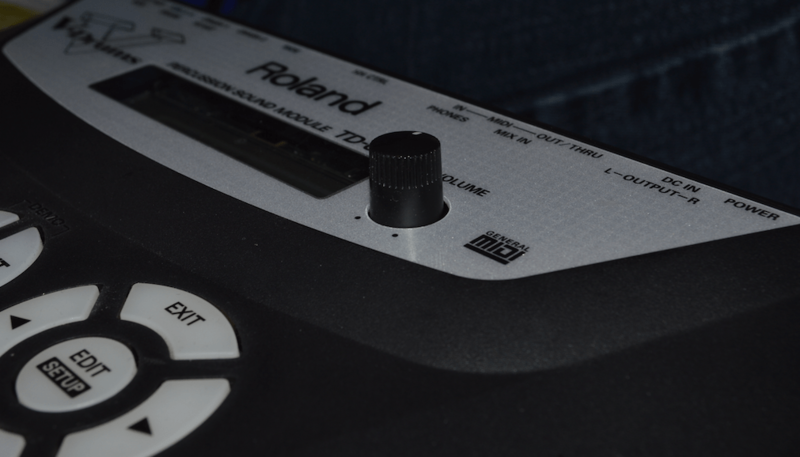 With the bottom cover off we can see the main processor board, which is typical of Roland products, a bunch of analog audio components, and a sweet collection of Roland branded custom ASICs. There are a couple of ribbon cables disappearing down either side of the board, so there must be another board below this one. Carefully pull out the ribbon cables, and push them to the side, and remove the six silver coloured screws from the PCB and three more black self tappers from the rear panel. Lift out the main processor PCB to reveal the next PCB which is the Display and Keypad board. Before you can lift that out you need to remove the Volume button from the front panel. Simply pull gently but firmly on the rotary volume control knob to pull it off the shaft. At this point I was still suspecting that it would be the main output jacks but when I went to pull off the volume knob I realised there was far too much free play in it. Further investigation would be needed here. 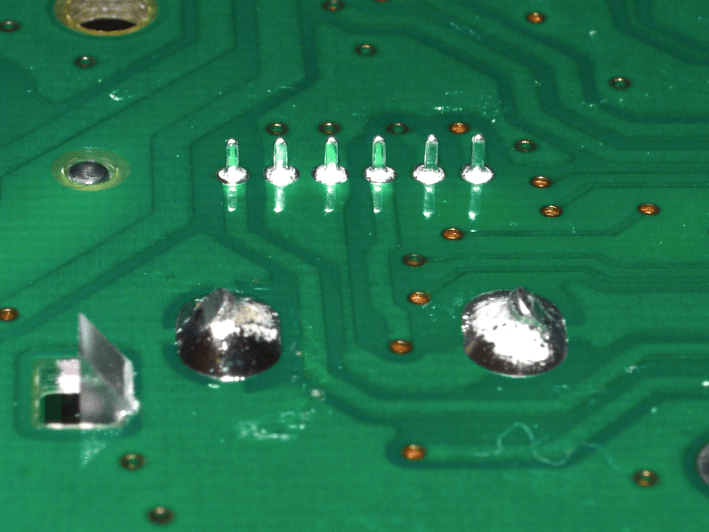 Once I’d pulled out this PCB I took a good look at the volume control and could see it had taken some damage. 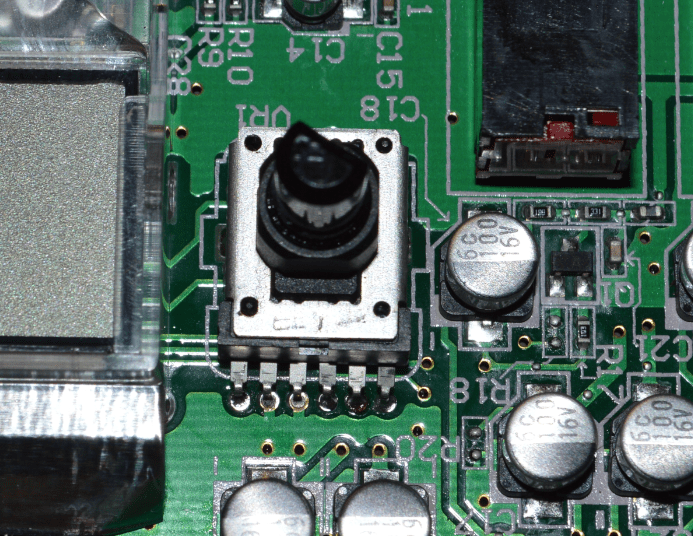 Look at this closeup of the volume control on the board. (Click the image for a larger view). You can see that the terminal pins are bent, and the plastic part is out of place, pushed down from it’s metal cage, which is slightly bent, and towards the PCB. Looks like this volume knob has had a bash from the top, possibly when it was in storage or transit. However it was still working most of the time, but occasionally it just opened up a bit to far and the wipers inside lost contact with the tracks. To repair this, I need to remove the control from the PCB by desoldering the 6 terminal pins and the two mounting tags. 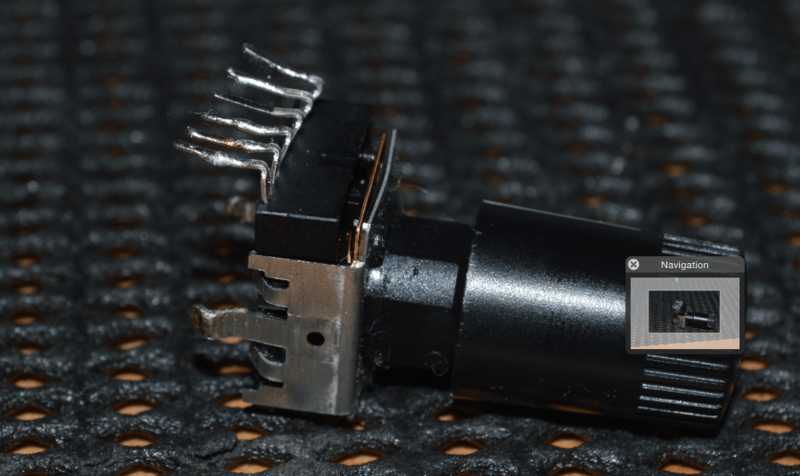 I use a combination of desoldering braid and a great product called ChipQuik which is a desoldering alloy which remains molten for a long time, enabling easy removal of things like this potentiometer. 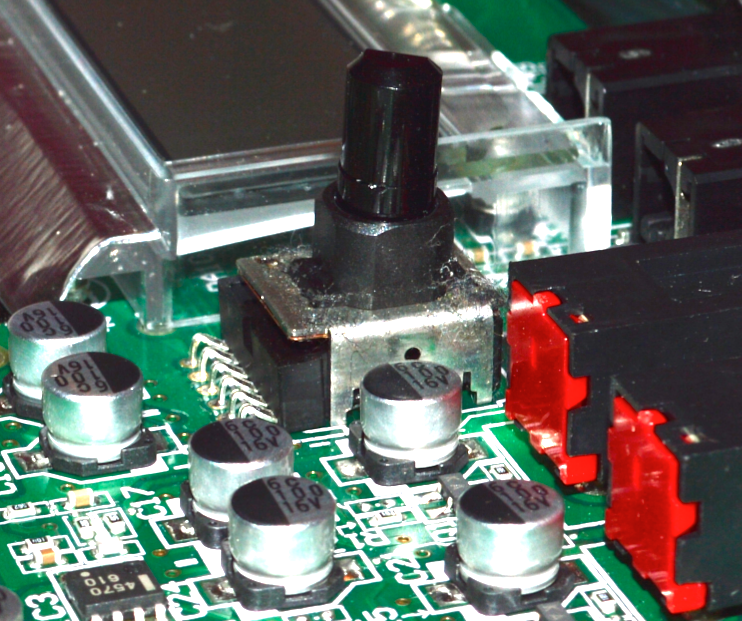 With the potentiometer removed from the board we can see the extent of the damage a bit more clearly. At some point it’s had a knock on the top of the knob, which has pushed the plastic part down through the metal cage and forced it out of shape. This was causing bad connections inside the control which was intermittently causing the volume to drop out. This should be easily repaired. By straightening the metal cage and bending the retaining clips back into shape the volume control should be perfectly serviceable again. I put it in my bench vice and straightened it all out, tightened up the metal retaining lugs, and gently straightened the terminal pins again and it was ready to replace in the board. Replacement is easy, drop it into place and solder it up. One thing I did do was fill the gap between the bottom of the potentiometer and the PCB with a fiber washer. If it gets a knock on the top again, this time it won’t deform and breakdown. I carefully reassembled the whole machine again and it was time for a quick test. The machine performed flawlessly, and there’s no dropouts when wiggling the volume control. Job done! Apple’s new SpaceShip building takes off. (Video) What makes apple’s new watch tick?